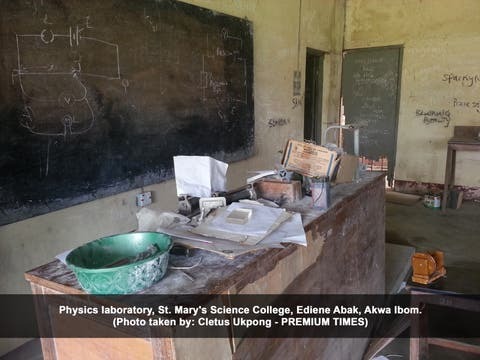 Almost everything – everything that makes a school a school — is in a state of decay at St. Mary’s Science College, Ediene Abak, in oil-rich Akwa Ibom State. The ruins of the old cottages making up the boys’ dormitory can be seen a few meters away. Blown-off roofs, partly-collapsed structures, dirty and abandoned buildings surrounded by tall grasses conjure a nauseating atmosphere around the dormitory. Yet students live within these decrepit facilities, oblivious of the potential safety dangers. When a PREMIUM TIMES reporter visited the school in April last year, some students were seen still living in one of the dormitories – Cottage Five. A section of the building had fallen down, and the debris were yet to be completely cleared away. Nothing much has changed one year after, a follow-up visit this April shows. The ceilings has fallen off in most of the cottages. For one or two that still have their ceilings partly intact, there are visible signs that they are caving in gradually. Yet the students have continued to live in that condition, endangering their lives. The remnants of the ceilings are covered with graffiti. And the dormitory walls too. It looks like the walls have not been touched with fresh paints for decades. Standing on the hill where the cottages are situated, this reporter can see some other buildings in the school down a valley, swallowed up by gully erosion which is threatening the school. You can see the dormitory’s pit toilets and also perceive the stench oozing out from there. Empty cans, dirty plates, and papers littered everywhere inside the cottages. The mattresses, as dirty and stinking as they are, have no bedcovers. The pillows too were terribly dirty and nauseating. Garbage can be seen heaped carelessly at various locations near the dormitories. Mr Okon and other alumni of the college resorted to flooding Facebook with photos of the school, after making fruitless efforts to get the Akwa Ibom State government to renovate the dilapidated structures. St. Mary’s Science College was built 65 years ago by Catholic missionaries. It was initially established for the training of Grade Two teachers before it was converted in 1986 to a senior science college by the government of the then Cross River State in line with the administration’s policy of promoting science education. At the height of its glory, it was one of the most coveted schools in the old Cross River State. Parents from far and near scrambled to push their wards in. But today it is in ruins, and holds little or no attraction for parents, alumni say. “This is disheartening,” Mr Okon, the alumnus who guided this reporter round the college, says with a sigh while standing atop the collapsed half of Cottage Five. “This used to be my hostel,” he says. 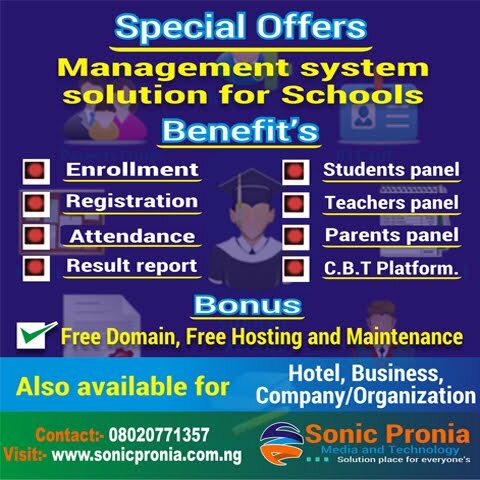 Mr Okon, a web designer, graduated from the college 23 years ago. He says with its present state of decay, he cannot recommend the school to any prospective student. David Wilson, an expert in mental health, shakes his head in disbelief when this reporter shows him photos of the school’s dilapidated dormitory. He advises the state government to close down the boarding facilities in the college to save the students from developing mental problems. “It could lead to psychiatric disorder,” says Mr Wilson, a medical doctor and senior registrar, Department of Mental Health, University of Uyo Teaching Hospital. “It could also lead to conduct disorder. The classrooms, library and the science laboratories in the college are also in appalling conditions. The tables, shelves, and books in the library are all covered in dust, indicating that the place may have been out of use for sometime. The small hall used as chemistry and biology laboratories are dusty, and without basic science equipment and chemical. And what is left of the Agric laboratory is a building in ruins, with no roof and windows. A boy and a girl are in one of the classrooms. The girl, a 16-year old SS 3 student, says she ought to be in the laboratory for physics experiment at that time, but that she was barred because she could not provide the type of battery required for the practical session. “I bought Tiger Head battery opposite the school gate, but the physics teacher rejected it because it wasn’t strong enough to power the ammeter and voltmeter in the laboratory,” she explains. She does not have the money to buy the required battery, she says. The boy, also 16 and in SS 3, had had his own time at the laboratory the previous day. Both students have just two days to go before their West African Senior Secondary School Certificate Examination (WASSCE). This reporter meets with the physics teacher, Iboro Dickson, in the physics laboratory as he was taking five students through the science experiment. Mr Dickson, himself a former student of the college, explains that since the school cannot provide the materials needed for the experiment, students must be made to bear the burden. The physics laboratory, like the other laboratories, is without learning apparatus and other materials. More so, it is dirty. The building has no ceilings and louvers. Behind where the students are sitting, at one corner of the small hall, is a heap of computer scraps. And that is what the college calls a computer laboratory! Ambrose Useh, the Principal of the college says a government team came to inspect the school in March 2017 after he wrote to the education ministry. 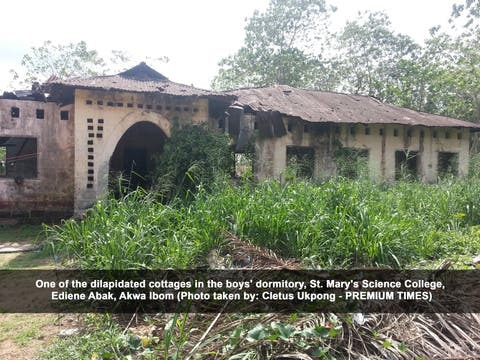 The condition of the girls’ dormitory is not as bad as that of the boys’, says Mr. Useh who says he assumed duties in August 2016 as principal of the once prestigious college. This reporter, being male, is not allowed to inspect the female dormitories. The parents-teachers association in the school has been inactive, alumni say. Successive administrations in the state have consistently claimed that reforming the education sector remained a top priority. In 2014 and 2015, the government specifically budgeted N500 million and N450 million respectively for the renovation and refurbishing of buildings, and provision of facilities in 124 primary and secondary schools in the state. The government’s plan then, as documented in the budget, was to renovate four secondary schools and four primary schools in each of the 31 local government areas in the state. Funds were also specifically allocated for the renovation of boarding facilities in secondary schools in the state — N100 million (in 2014) and N200 million (in 2015). That was beside the N100 million and the N40 million earmarked in 2014 and 2015 respectively for the provision of 2,725 beds for 62 boarding schools and the N100 million and N55 million budgeted for in 2014 and 2015 respectively for the provision of 5,500 mattresses in secondary schools. There was also provision for another N300 million, both in 2014 and 2015 budget, as subvention to 234 secondary schools. 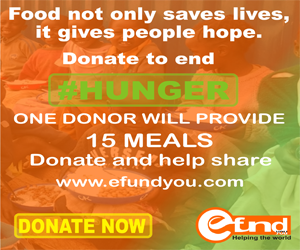 It remains unclear whether these funds were released or whether the projects for which they were meant were executed. Pressed for months for explanations, education ministry officials consistently declined to comment. What is however clear, is that a good number of schools across the state remain dilapidated and bereft of essential facilities. Administration insiders, who asked not to be named for fear of being punished by the authorities, say St. Mary’s Science College, like most of the schools, is a victim of poor management of public funds and corruption among government officials. Contracts for the renovation of public schools are awarded in most cases as a measure of political patronage to people who will in turn pocket the money, they say. And this, of course, happens in collusion with government officials. [color=#006600]The state government, in a document circulated on Facebook by the state Commissioner for Information, Charles Udoh, claim Governor Udom Emmanuel administration has constructed and renovated 62 school blocks in the state so far. The government is, however, yet to provide details of the locations of the projects. Several requests by this reporters are yet to be responded to. A member of the Akwa Ibom State House of Assembly, Aniekan Bassey, who is an alumnus of the college, has stepped in to lobby the state government to save the school. Mr Bassey, who represents Uruan State Constituency in the House, took some of the aides of Governor Emmanuel on a tour of the college. He says he was later assured that a new dormitory and classroom blocks would be built during the next round of the state government’s Inter-Ministerial Direct Labour Projects. The lawmaker says he became aware of the state of the school when a fellow House member, Friday Iwok (PDP/Abak State Constituency), raised the matter during a recent plenary. Another lawmaker Otobong Akpan (PDP/Ukanafun State Constituency), also an alumnus of the college, says it was sad that the school was left to rot away. “Why did the school authorities keep quiet for things to get to that state? What happened to the subventions given to the school by the government?” Mr Akpan asks. Idongesit Reuben, a businessman and an alumnus of the school, tells PREMIUM TIMES his concern is more on the safety of the students. A repeat visit to the school by this reporter on April 6, 2018, one year after, shows no significant improvement so far; saved for the replacement of the roof on three buildings, the hostels and the main classroom block are still in their decaying and squalour state. There are signs of reconstruction work at the library building but the students on campus, who are writing their senior school certificate examination, tell PREMIUM TIMES the contractor abandoned site four weeks earlier. This reporter had contacted several administration officials on the state of the college as he worked on this story. It is unclear if the government moved in to do some remedial work as a way of preempting this publication. Patrick Akpabio, a Catholic priest and Chaplain of the college, believes it might be counterproductive waiting for government to tackle the infrastructural deficit in the school. Mr Akpabio, who also teaches at the school, is, therefore, mobilising personal resources to build a new chapel for the school after the first one collapsed. “This is the only pair of shoes I have,” the priest says, pointing to his thick black boots.